Common Sense For Belmar › “Miscue”? Once again, thank you Coast Star! This was written by admin. Posted on Thursday, February 7, 2019, at 8:03 am. Filed under Uncategorized. Bookmark the permalink. Follow comments here with the RSS feed. Post a comment or leave a trackback. I don’t care how you get to Trenton…………Just get the damn money. Tell Maser to take a flying leap. according to the above, State prohibition refers to Maser’s violation of rules. 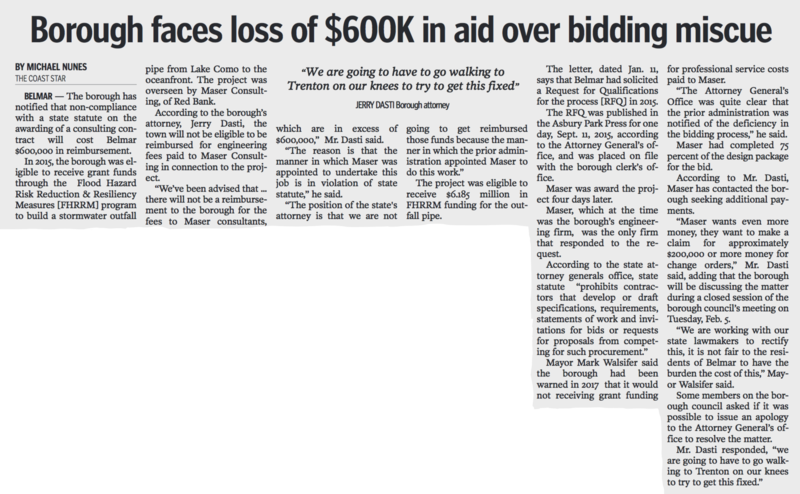 They, Maser, should be forced by the STNJ to reimburse Belmar because they, Maser, knew they were ineligible while they were, at the time of the RFQ, employed by Belmar. Where’s Claire? I can’t belive this the debit how many millions? lawsuitsetc. Maybe just maybe your blind faith was wrong ? Wouldnt call you out but all you did was defend this guy at every turn? Crickets ? Your Silence speaks volumes! #3 – Claire’s been out of it for quit awhile. Let’s leave her out of all this. #4 Claire is a nice woman and because of that her support for Doherty carried a lot of weight, but look where that has led us. When did she tell us that her opinion of Doherty and his crowd had changed? i do not recall that so when was ‘quite awhile’ ago? Sadly by never recognizing the hole that was being dug for the citizen/freight [tax]payers of Belmar her silence contributed to the state of debt and realization of gross mismanagement we now observe. Not very different than Doherty’s dupes on the council.